At age 37, Cecilia Braekhus has built a strong case for being the greatest female boxing champion ever to walk the earth. If one's criteria for determining that status is performance under championship conditions, her qualifications are beyond question: She has held at least one major world title since March 14, 2009, and in that time she has made 23 defenses of the WBC title, 22 of the WBA strap, 20 defenses of the WBO title, eight defenses of the IBF strap and eight defenses of the undisputed championship, the most ever recorded by anyone -- man or woman -- in the four-belt era. Add to that her reported 75-5 amateur record and victories over 12 opponents who have held titles at some point in their careers, and one can see why she is called boxing's "First Lady." Braekhus will be making her second (and final) HBO appearance against Aleksandra Magdziak Lopes, a 38-year-old Pole who has lived in the U.S. since age 16, is a full-time lawyer, and who is challenging for 147-pound honors after two failed attempts at the vacant WBC super welterweight title against Mikaela Lauren (a common opponent) and Ewa Piatkowska. Will moving down the scale give Lopes the needed strength advantage to overcome Braekhus' skills or will Braekhus prove once again that she is (as WWE legend Bret Hart often said) "the best there is, the best there was and the best there ever will be"? 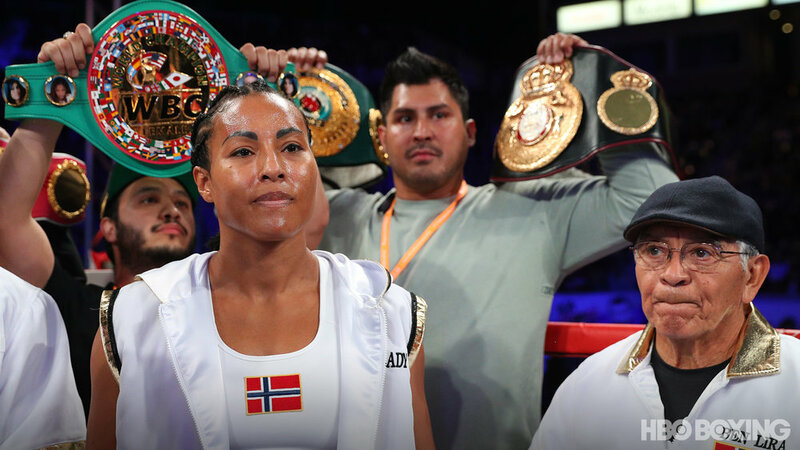 In her first HBO appearance against Kali Reis (who also was moving down in weight to challenge Braekhus), the Norway-based Colombian was tested more severely than usual in that Reis scored a knockdown in the seventh and followed up with a strong eighth and ninth before Braekhus rebounded in the 10th. Still, the final numbers favored Braekhus as she was more active (37.7 punches per two-minute round to Reis' 35.7), landed more in each phase (115-78 overall, 38-12 jabs, 77-66 power), connected more accurately (31%-22% overall, 20%-9% jabs, 42%-29% power) and led the CompuBox round-by-round breakdowns 9-1 overall, 9-0-1 jabs and 6-4 power en route to capturing all three judges' scorecards (96-93 twice, 97-92). Including the Reis victory, Braekhus has earned statistical leads over her four CompuBox-tracked opponents in that she has been more active (38 per two-minute round to her foes' 33.8), landed more (11.9 to 6.4 total connects per two-minute round, 4.1 to 1.5 landed jabs per two-minute round and 7.8 to 4.9 power connects per two-minute round) and landed much more frequently (31%-19% overall, 22%-11% jabs, 40%-24% power). But Father Time (and Mother Nature) eventually snares everyone, and one must wonder if that time will come when Braekhus is inside a boxing ring? Yes, the 38-year-old Lopes is 17 months older than Braekhus, but she hopes that her size and relative freshness (25 fights to Braekhus' 34 and 162 rounds to Braekhus' 264) will provide adequate compensation.